As the GSHP systems have relatively high installation costs, it is important that geological data and knowledge is available so that costs can be minimized. Furthermore, detailed geological information like surface and sub-surface temperature, thermal properties of the soil, water table, flow direction and type of soil etc. 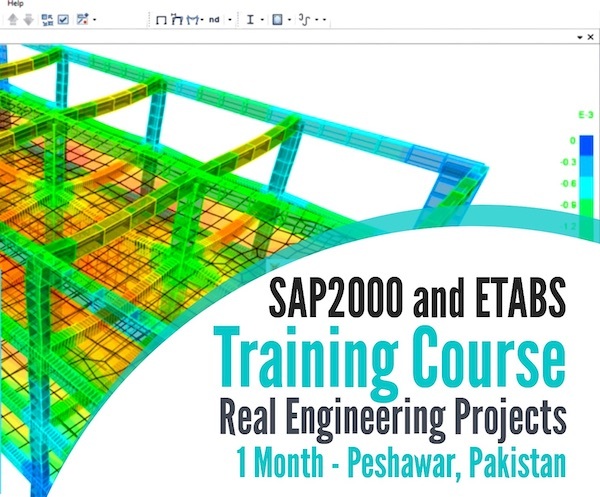 is also required for efficient design of the system. GSHPs can be installed at virtually any location, but the type of system, open or closed loop; the choice of ground collector loop, horizontal or vertical and the size of the loop all depend on local geological conditions. This is the rate at which heat can be transferred to the pipes from the ground or from the pipes to the ground. This can be determined by finding the thermal conductivity and diffusivity of the ground. Thermal Conductivity is the capacity of the material to conduct heat. Thermal conductivity is evaluated in terms of the Fourier's Law for heat conduction. Heat transfer occurs at a lower rate in materials of low thermal conductivity than in materials of high thermal conductivity. Materials of low thermal conductivity are used as thermal insulation while materials of high thermal conductivity are used in heat sink applications. Thermal conductivity decreases with increase in porosity of the soil/rock but the amount of variation is different for different types of material. Generally, thermal conductivity and specific heat are increased for saturated rocks. Thermal Diffusivity is the rate at which heat is transferred through a medium. It measures the rate of transfer of heat of a material from the hot side to the cold side. It has the SI derived unit of m²/s. The level of water saturation has a significant impact on the thermal conductivity of the ground. Generally, thermal diffusivity is enhanced for saturated rocks. At depths of about 15m in the ground, the temperature is approximately constant and equal to the mean annual air temperature of that area. If the location and height of an area is know, its mean annual air temperature can also be estimated. The ground absorbs the heat and transmits it down through thermal diffusivity. At times of minimum air temperature ground temperatures are generally slightly higher and at times of maximum air temperatures ground temperatures are lower. This effect is what is utilized for the heating and cooling functionality of the GSHP. A glimpse of this phenomena is also observed in basements/cellars in the buildings, which are relatively cooler in summer and warmer in winters. 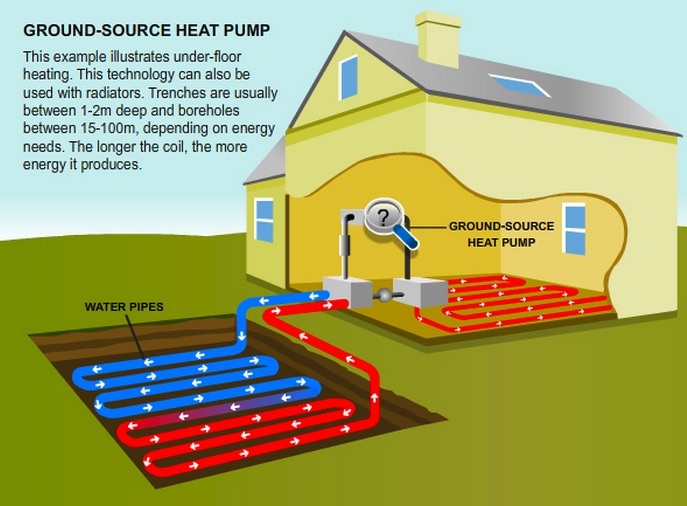 Thermal properties of the ground are clearly affected by its saturation level hence, it can easily affect the efficiency of ground source heat pumps, especially closed loop systems. Poor quality groundwater can also be an issue, as high total dissolved solids contents, particularly high chloride and sulphate ion concentrations, can be corrosive to some casing materials. 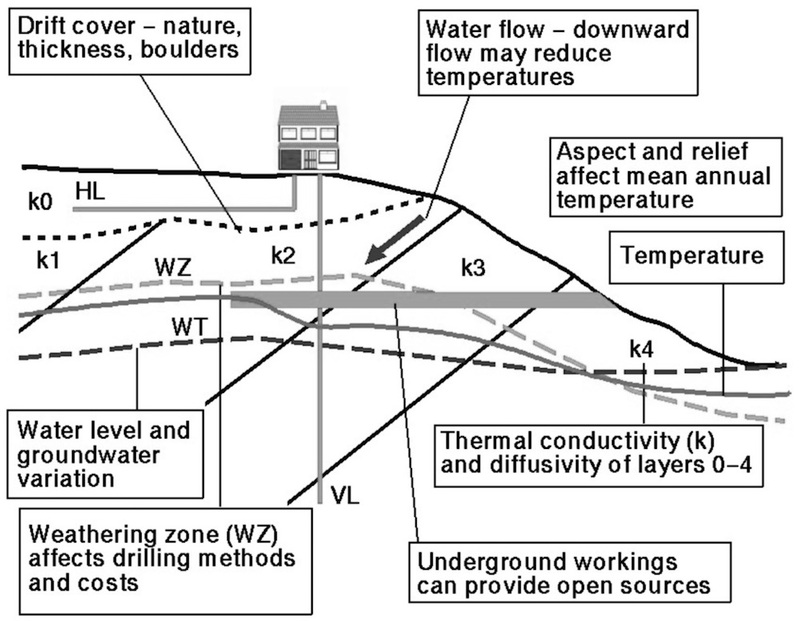 When the collector loop is below the water table in an aquifer with significant groundwater flow, heat transport away from the site will occur. This can take away the warmth or coolth away from the heat exchanger and bring new cooler or warmer water respectively as may be required. But thermal interference like this is not constant, unpredictable and even immeasurable in many cases and can also cause problems in the working of the ground source heat pumps. It is vital that these aspects are assessed to ensure that the appropriate GSHP installation is designed, the correct method of installation is used (drilling or trenching) and hence the installation is appropriately costed.